For the first time this school year we documented seven academic and non-academic goals for Amber. 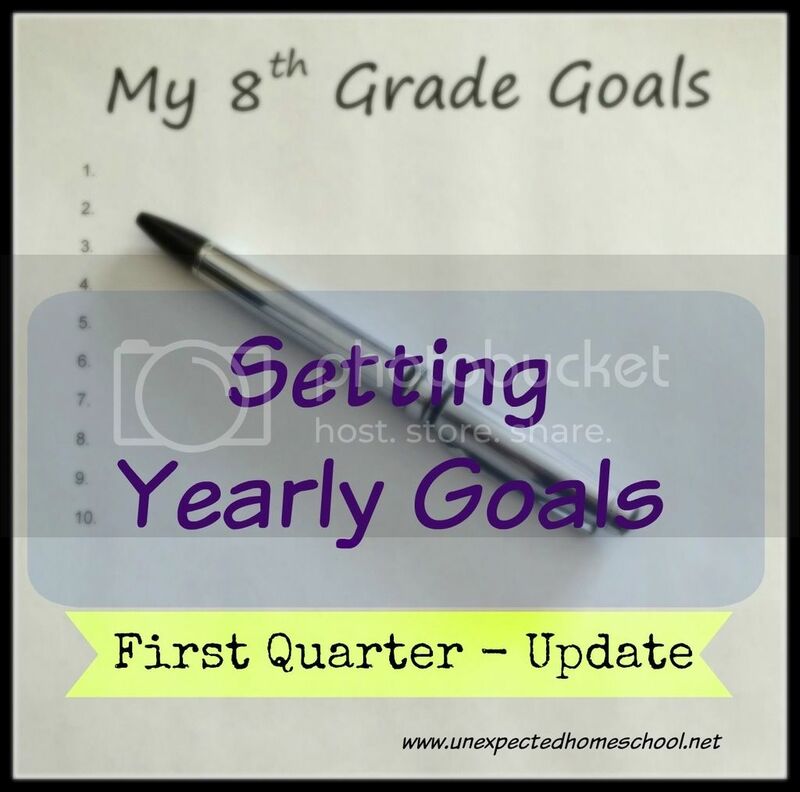 Now that we've completed roughly a quarter of our school year, we're checking in to see how those goals are progressing. Regular Exercise: This one is a mixed bag. We've not done well with attending Amber's water walking and water aerobics classes. She always finds a reason we should not go. However, Amber did start weekly physical therapy for her Ehlers Danlos and has been diligent on doing her at-home program from the therapists. She also has been participating in more physically active events with friends and her cousins. Timely Chore Completion: Slow progress is being made here. Amber honestly tries to finish her regularly assigned tasks, but often makes them a lower priority than more enjoyable activities. Unfortunately, this results in the chores not always being completed in a timely fashion. Still, she is more consistent in completing the chores than this past summer. Waking Earlier; More Consistent Bedtime: Early success that's already had a setback. Huge strides were made in the waking earlier portion of this in the beginning of the school year. Then Amber went through several dysautonomia crashes (flares) and since then it has been difficult to get back to our earlier mornings. We are working on it. However, her bedtimes are consistent almost every night and within the desired time frame. Her sleep quality has been poor since the dysautonomia crashes though, so we really need to work on that before the earlier mornings can happen. Daily Set Schedule: The idea was to gradually return to a set schedule. We have been following our outlined daily lesson plans closer, even if not exactly as scheduled. With all the appointments we have each week, we do need to follow a decent schedule just to be on time. Still, some mornings we miss out on school in order to allow for needed sleep and preparation for the appointments. Amber does look to her scheduled lessons each day and tries to do them in order as much as can be completed. Waking earlier will make the schedule goal much easier to fulfill. Still, we feel progress is being made on this goal. Assignment Responsibility: This is one where Amber has already shown fantastic growth. She self starts most days by using her online access to the scheduled lessons. She pushes through exhaustion many days to complete the last of her lessons. She will often ask me for guidance when it is clear we cannot complete all the scheduled lessons, yet does not balk when I drop a favored subject over a more difficult topic. All in all, I consider this goal already met assuming she keeps it up. Flute Practice: Zero progress. This doesn't mean that Amber does not practice her flute. Quite to the contrary. She practices anywhere from 4-6 days a week for 30-45 minutes. It's the reminders and nagging to practice where the progress is lacking. Amber honestly enjoys playing the flute, but often does not want to put out the extra energy or stop another activity. If we can just get her started each session she plays without incident. Unfortunately, I'm still nagging and she still rarely practices without reminders. There's always room for improvement towards any goal we set, but it sounds like Amber is doing quite fine considering. I always set goals, but I know they are way ambitious. Without goals to strive for, I think the kids and I wouldn't get a whole lot accomplished. Sometimes they surprise me though!